The icon shows Adam and Eve standing before Jesus Christ [1.]. Prior to their descent into sin through disobedience, Adam and Eve were blessed with a beautiful relationship of communion and fellowship with God. 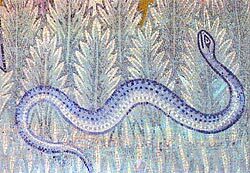 However, they were tempted by the devil appearing in the form of a serpent [2.] to disobey God and eat from the tree of the knowledge of good and evil (Genesis 2:15-17). 2. 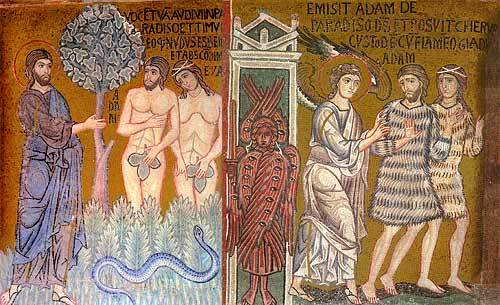 Adam and Eve were tempted to sin by the devil who appeared to them as a serpent. 3. 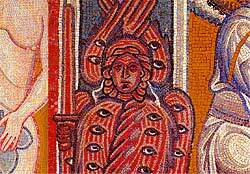 A cherubim with a flaming sword was appointed by God to guard the gate of Eden and the way to the tree of life. 4. For their disobedience, the Lord has Adam and Eve expelled from Paradise. They leave dressed in garments prepared by God. Because of their disobedience the Lord expelled them from the garden. The icon shows the Archangel of the Lord directing them out of Paradise, through the gate of Eden where God placed “the cherubim and a sword flaming and guarding the way to the tree of life” (3:23-24) [3.]. Adam and Eve are dressed in the garments of skins made for them by God (3:20) [4.]. The fact is of real value only when it stems from a pure heart; when one is ready to deny wealth, and stand above money; when one is ready to give alms to the poor; when one has love and affection, not only for one's own children, but also for the orphans and the poor. One manifests real fasting when he is ready to deprive himself of food, in order that the hungry and destitute might be fed. One really fasts when he maintains his equilibrium under all stress, never allowing himself to lose his temper and explode like a volcano, destroying everyone around him.